Shop the range of innovative hair repair treatments from Olaplex here at Mankind. Innovative hair repairing treatment Olaplex is a game-changer in the hair industry. They offer a three step process designed to restore compromised hair. The first two steps are only available to use in salons, but you can purchase the third step to use at home. Containing a patented active ingredient, it works on a molecular level to seek out broken bonds caused by chemical, thermal and mechanical damage. Olaplex works by reconnecting broken bonds within the hair. By building artificial bonds to replace the missing ones, it strengthens the hair, allowing you to colour your hair whilst causing less damage. 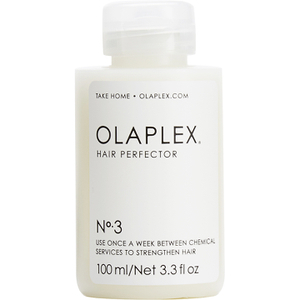 The Olaplex No.3 Hair Perfector is the third step in an Olaplex, designed for use at home to strengthen and recondition dry, damaged and brittle hair. Containing the same active ingredients found in the salon treatments, 1 and 2, the advanced formula maintains healthier looking hair with professional looking results. The bond multiplying system reconnects broken disulphide sulphur bonds in the hair, resetting it from within for enhanced growth, structure and integrity. Suitable for all hair types, it prolongs colour vitality and vibrancy whilst strengthening the core follicle for a smoother, suppler finish. Olaplex is free from silicone, sulphates, phthalates, DEA, aldehydes and gluten and is not tested on animals. Interested in lightening your hair? Read everything you need to know about going blond.